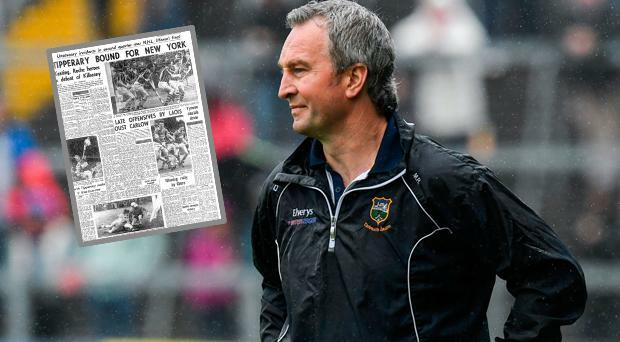 Tipperary manager Michael Ryan's recent on-off-on relationship with the media retrained the spotlight on the often strained relationship between the GAA and the Fourth Estate. Given time to reflect, Ryan appeared to take stock and row back, realising perhaps that by not co-operating he might be inviting more trouble than it's worth. But in some instances the line is crossed and there is no going back. The GAA has traditionally been sensitive, sometimes notoriously so, about objective criticism - instead tending to regard journalists as useful propaganda tools. In his heyday the distinguished penman Paddy Downey would object to being called a GAA journalist as this implied that he was working for the GAA rather than being an independent observer. Instead, he preferred to be called a Gaelic games correspondent. Downey was one of a number of six journalists who fell foul of the GAA in 1968, 50 years ago, in a famous case that created much turmoil and led to the GAA being condemned by the NUJ and from other quarters for a heavy-handed approach. The controversy erupted after a bad-tempered National League hurling final between rivals Kilkenny and Tipperary, with graphic reporting of the events from the main correspondents of the day incensing the Tipperary county board. Suitably miffed, the board targeted six journalists including Downey, instructing anyone connected to their hurling team not to co-operate with those on the black-list. The others in the doghouse included John D Hickey and Donal Carroll of the Irish Independent, Mick Dunne, Gerry McCarthy and Padraig Puirseil of the Irish Press. John D Hickey noted that the National League final had produced "eight scandalous minutes [of] acts of violence that must have sickened every spectator . . . with a shred of respect for the precepts of law and order, never mind the canons of good sportsmanship". Mick Dunne wrote about "the most despicable and disgraceful exhibition of outright viciousness witnessed in Croke Park for many years". Downey in the Irish Times described an "ugly and malicious" affair. In a retaliatory strike, the NUJ's Dublin branch instructed its members not to report, comment on, or handle any GAA news emerging from Tipperary and stated that is condemned the county board's attempt "to curb objective comment". Previewing the All Ireland final between Tipp and Wexford later that year, while still under restrictions, Downey informed his Irish Times readers that he could offer no more than an acknowledgement that the final was taking place. He wrote: "It is quite impossible to form any firm opinion on the basis of up-to-the-minute information and trends because, while there has been free access to Wexford's preparations and generous co-operation from Wexford's officials, the opposing camp, through its County Board, has refused to release information to this writer, among others." At the time, unlike now, journalists were free to drop into county training sessions in the run-up to All-Ireland finals. It is believed that Galway in 1979 were the first county to introduce closed training sessions and reduce media access in the lead-up to their All-Ireland final with Kilkenny. The dispute of a half century ago created much interest and debate. In October 1968, the South Tipperary Agricultural Committee called for an end to the ban on national newspapers reporting on Tipperary GAA matches and news items. At a meeting in Clonmel a Mr Clancy urged members to inform newsagents that they would not buy the papers until the ban was lifted. After the All Ireland hurling final that year, won by Wexford, the Tipp board lifted its restrictions. Soon after NUJ removed its restrictions too. Both parties ultimately realised they needed each other even if they didn't always see eye to eye.